With my laissez-faire approach to dog-walking, there’s a lot of down time. Sure, go ahead and sniff that. But of course, stop and stare at this if you like. Why not lie down in the middle of the street and refuse to budge? Who am I to disrupt these principled protests of a Bartlebyesque nature? I am generally happy to wait patiently for forward progress to resume, though I often yearn for some distraction during these lulls. One morning, heading out for a walk, a bright idea came to me. I could combine my two passions: standing idle beside my dog, alert or prostrate as she may be, and reading. Surely the dog’s leisurely investigations would allow me plenty of time to speed through a novel. 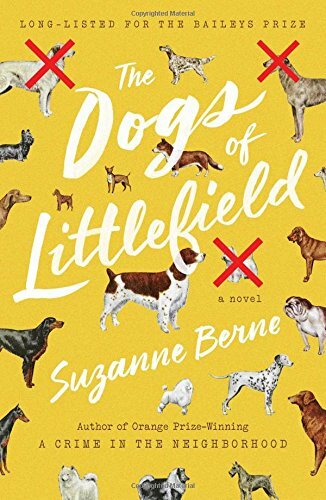 I therefore tucked a copy of Suzanne Berne’s latest, The Dogs of Littlefield, under my arm before being tugged out the door by my basset hound, eager as always to make her mark in the world — and smell the marks other dogs had already made. Before we had made it a block, I had breezed through the novel’s opening chapter, in which a boisterous lab puppy, Binx, breaks away from his owner and follows his nose to a gruesome discovery in the nearby woods: the corpse of a bullmastiff. The “bloodied, yellowish foam” around its muzzle indicates that the bullmastiff has been poisoned, perhaps by the person who had been putting up menacing, anti-dog flyers around the affluent Massachusetts town of Littlefield. (“Leash Your Beast Or Else.”) Or perhaps the pooch could have ingested poison meant for the town’s coyote population? More terrifying, it could simply be an act of motiveless malignity. I hastened to the local park, dragging along my reluctant basset, who, not being able to read, didn’t understand the source of my anxiety. Once there, I took refuge in the dog-walking community, the “small battalion of regulars” with whom I regularly exchanged pet-related banter. I knew their dogs’ names but not theirs. They knew my dog but neither my name nor, depressingly, my face. When my stepbrother dog-sat for me last summer, he told me that the owners of Argus and Molly, two women whom I saw on a daily basis, had approached him in the park and begun chatting with him quite familiarly. After several minutes, he realized that they had simply spotted the basset hound and assumed the indistinct mass on the other end of her leash was the usual walker, that is, me. My stepbrother felt duty-bound to enlighten them. There are other characters of varying eccentricity, each of whom I found infinitely more appealing than the married couple I soon bumped into near the center of the park. At the sight of my basset, their French bulldog strained at the leash. This display of excitement did not please the wife, who used the pauses between her barked, unheeded commands to hurl imprecations at her husband, who had stubbornly refused to send the dog to obedience school during its formative years. I had witnessed this same marital drama several times before, once even venturing my opinion that obedience schools were fascist, a statement that perplexed husband, wife, and bulldog alike. All was quiet for a moment before their chorus of growling and recriminations resumed. This time, I calmly flipped to page 30 of The Dogs of Littlefield, quoted George Wechsler — “All dogs are anarchists at heart” — and headed off. Leaving the bickering couple, I next saluted a young man I hadn’t seen before, my basset hound gaily greeting his greyhound. Watching the mismatched pair sniff each other, one regally gaunt, the other majestically squat, I commenced the pleasantries. He huffily replied that he thought my dog was in fact the funny looking one. Sensing I had come across a specimen of homo unironicus, I tried a new approach. This went over slightly better. His tone switched from offended to patronizing. Looking for a quick exit, I held up The Dogs of Littlefield. …they were afraid of everything. They projected their fears onto everything. Everything they could do nothing about, but had the wit to recognize. The whole world surrounded them: a black forest crawling with beasts and creatures, phantoms, monsters. Discovering the villain’s motive and method will therefore not restore order to the community. Because there is something endemically infecting the town psyche, the resolution to the mystery cannot dispel the lingering unease in Littlefield, “strangely infatuated with the idea of menace” as it is. But I was getting ahead of myself. I had not even reached the end of the novel yet. My basset, perhaps sensing my desire to finish the captivating book, brusquely yanked me over to a bench. Witnessing this, a smug park-goer saw fit to make the following observation. Ha, ha, yes, well put. I met the man’s aperçu with a self-deprecating laugh, all the while wishing he would walk himself straight into a ditch. I sat down to read the last pages of The Dogs of Littlefield, the comic passages becoming less frequent as the novel dissected the ineradicable unhappiness of the aptly named Downing family. Across the park, two frolicking mutts had been let off-leash in blatant violation of the numerous posted signs. I was tempted, but hadn’t I just read a novel about the perils of unattended pets? “Leash Your Beast Or Else.” Moreover, my basset hound never obeyed my calls, would follow any ungodly smell to its more ungodly source, and routinely tripped over her stubby little legs, or ground-kissing ears, when attempting to keep up with swifter dogs. 'A Line Made by Walking' has the unusual quality of documenting Frankie's descent into depression and yet celebrating aspects of life taken for granted. As an English professor and unabashed therapy-junkie, I recently made it my business to read every YA novel I could find in which an adolescent protagonist visits a psychotherapist. In writing about a novel like 'The Fishermen', I find myself in a dilemma. I loved it. I'm tempted to make a grand claim about this book, but which should I make? Hilarious! The very last line is a modern classic. In order to enjoy the Twilight novels, you have to be willing to enter into an intense emotional and hormonal fundamentalism, the twin of the moral fundamentalism apparent in Meyer's refusal of nuance and ambivalence in favor of an either/or approach to good and evil.